When I first read the recipe for these chocolate chip cookies I have to admit I was a little dubious. I have childhood memories of healthy hippy cakes that were dense, inedible brickbats due to an overly virtuous use of wholemeal flour. Even worse was when the sugar was replaced with honey, so they had a dense, heavy fragrance that smelt sickly and overly sweet . These memories have given me a lifelong aversion to the entire concept of healthy cakes and sweets. Cakes and sweets are treats, meant to be eaten in moderation so why bother trying to make them healthier because they will never really be super healthy. It’s more important not to waste your sweet quota on second rate and awful sweets because if you’re going to eat sweets they might as well taste really, really good. A couple of things changed my mind – firstly everyone who made these cookies absolutely raved about them, in fact went into superlative overdrive, trying to describe them. Even though I’m not obsessed with questing the ultimate chocolate chip cookie ( I’ve been pretty happy with my basic Cadbury’s chocolate chip cookie for years) my curiosity about this cookie was piqued. More importantly though, my attitude to wholemeal flour has shifted over the years, mainly because the rough chaff like wholemeal flour of my childhood has been replaced by fine ground organic wholemeal flours that add another dimension of nutty, mellow warmth to baked goods. My natural instinct is still to mix half and half wholemeal and white flour while these cookies go the ‘full monty’ with wholemeal, but I have come to realise good high quality wholegrain flours can offer a whole different taste dimension. The point of these cookies isn’t that they are virtuously healthy though, they are just really, really good. 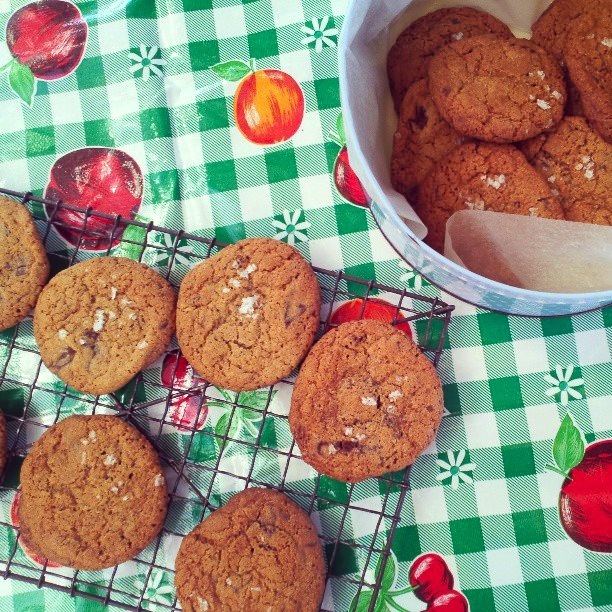 Even kids love these cookies and children as a rule don’t tend to be wholemeal flour fans. In fact I had one 11-year-old food critic call them exceptionally good maybe even the best chocolate chip cookie ever. The only thing I’ve messed around with is the size of the cookie. The original recipe rolls the dough into balls of about 3 tablespoons which gives you about 20 mega cookies of epic and somewhat daunting proportions. I have made more petit, normal sized cookies but perhaps because of the chocolate chunks they do seem to be better as a slightly over-sized but not so mammoth cookie. I roll them into about balls of about two tablespoons or the size of a walnut which gives me a yield of about 35 cookies for one batch of dough. The other thing to note is these cookies are absolutely at their most ‘exceptional’ when just baked or even slightly warm. For the ultimate in fresh baked cookies you can make the dough roll into balls and keep the balls in a sealed container in the refrigerator for up to a week or in the freezer ( for a month or so) then bake them off in small batches as desired. My personal preference is to freeze the balls of dough in one of those wide, flat, plastic pastry freezer containers, this allows me to forget about the cookie dough completely until a sudden cookie craving hits. 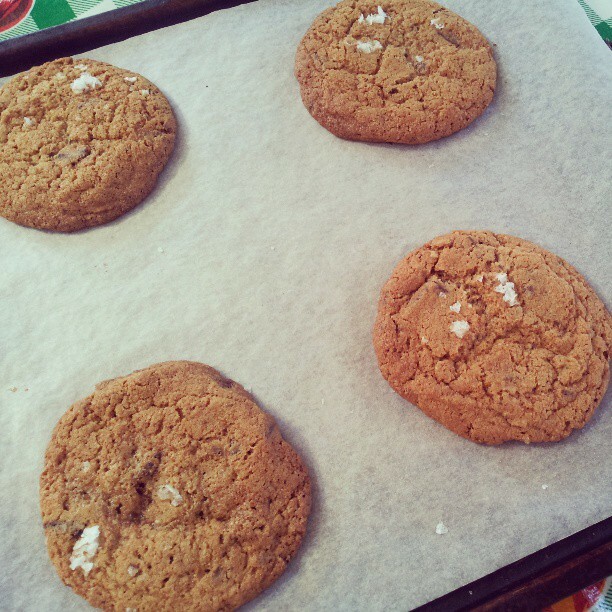 You can have freshly baked cookies, in the time it takes to pre-heat the oven and bake the cookies off. Apart from the wholemeal flour there’s nothing overly virtuous, dour or excessively wholesome about these cookies, you can spend your sweet quota happily because they really, really, are – exceptionally good. 220- 250 grams of dark chocolate chopped roughly in about 1 cm chunks. Whisk together wholemeal flour, salt, baking powder and bicarb soda. Cream butter and sugar until fluffy, add vanilla and eggs one at a time and mix until well incorporated. Fold through flour and and chocolate chunks and roll into walnut size balls. Chill dough balls in refrigerator for 2 hours or up to a week, or place balls of dough in a sealed container, freeze and forget. When you are ready to bake you cookies preheat oven 175C (350F) of 150C fanforced. 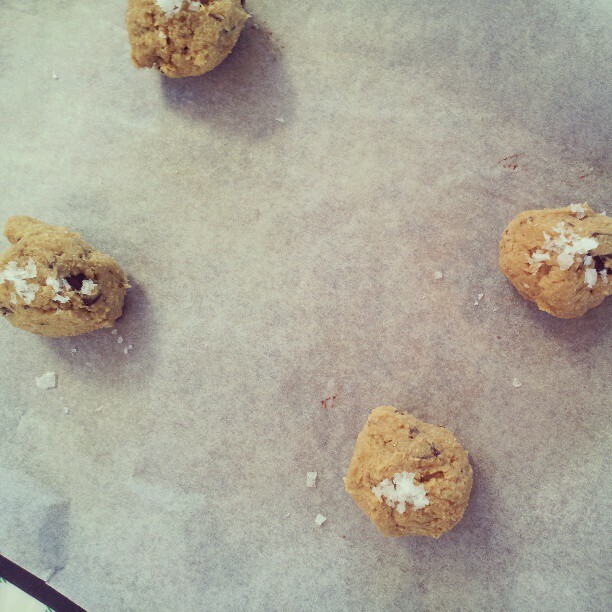 Place cookies on baking sheet about two inches apart and sprinkle tops with some salt flakes. Bake cookies for 16-20 minutes until lightly golden. Cool on baking sheets for five minutes, transfer to wire racks and cool for another ten minutes to eat slightly warm or cool completely to store for up to a week in airtight container.